Cyprus is the Island of Aphrodite. According to legend, Aphrodite was born out of the foamy waters near the coast of Paphos, a now-bustling beach town on the southwest part of the island. It is also known Cleopatra used to trek the island in search for the fountain of youth. Well I think I found it. Right there: out in the open. On this sleepy little island in the middle of the Mediterranean. I’m going to provide you a few secrets of the many natural bounties of this beautiful island. First and foremost: let’s eat SEASONALLY! It is now summertime in Cyprus, and the temperatures are scorching in the upper 90s F and even 100s F (40 C). No one has much of an appetite. But what is growing in abundance is water-based, fibrous fruits, which is the mainstay in this weather. It helps you hydrate and feel full. So today, we will discuss the summer fruits growing and their health benefits. Watermelon – a quenching fruit which helps to bring your core temperature down. 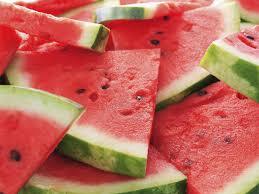 Watermelon is a natural kidney cleanser as it increases urine flow. The best way to overcome dehydration on those hot summer days is to feast on ruby red, naturally sweet watermelon. A common dinner in the Mediterranean is watermelon and feta cheese! The sweet/salty combo is mouthwatering. The cheese provides the protein; the watermelon everything else (fiber, vitamin C and natural sugar). In Cyprus, we also have a special Cypriot cheese called halloumi (Greek) or hellim (Turkish) which pairs beautifully with watermelon. When parents are on the go, this watermelon and cheese dinner is common fare for the family. Add some fresh, hot bread and the kids are happy, too. 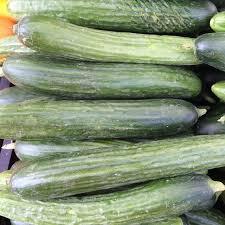 Cucumbers: these are great for kidney problems, since the seeds are diuretic. We also know that they are great for cosmetic purposes (which of us goddesses have not placed a slice or two on our eyes to reduce puffiness??) Full of fiber, these crunchy cukes are the base of salads in the summertime. In the Mediterranean, cucumbers grow easily and in abundance. They are in everyone’s kitchen. Children grab a chilled cucumber as their snack straight from the fridge (infinitely healthier than Doritos!). Cucumbers are part of nearly every meal in the summertime. Breakfast: sliced with some tomatoes, eaten with feta and some fresh bread and perhaps a boiled egg. For Lunch: in a salad with tomatoes, peppers, drizzled with olive oil and balsamic. For dinner: chopped and added to a homema, de tzatziki salad. Literally, we stuff ourselves with this low calorie, highly diuretic, fibrous, crunchy vine fruit/veg. 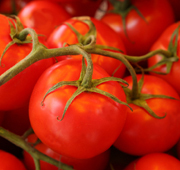 Tomatoes are eaten throughout the day in the Mediterranean. For breakfast: sliced alongside cucumbers, sprinkled with salt and eaten for breakfast with fresh bread. For lunch: in salads with peppers and cucumbers, drizzled with olive oil and balsamic vinegar. Dinner: as part of a soup (fresh tomato soup, gazpacho) or crushed and put into your favorite veggie recipe, including moussakka or with fresh green beans. Load up on your fresh, seasonal fruits and veggies, my fellow goddesses! Treat your body well on the inside, and see how you transform on the outside! If you have specific questions on recipes or health properties of these or other fruits/vegetables, please write to me! Discover your Inner Aphrodite. . . .